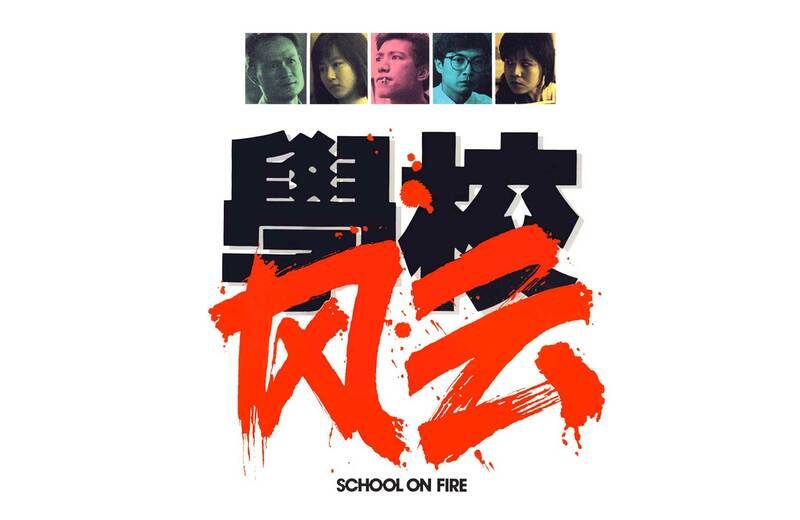 Turning an ultra-violent satire on consumer culture into one of the most highly merchandised films of the decade. Before realizing the magic of Verhoeven and ages ahead of crushing on Peter Weller or ED-209, I was a fan of the Sleeze Boyz’ brilliant dance single “RoboCop, Dance ‘til You Drop.” A die-hard fan of break-dancing after having seen Breakin’ (Joel Silberg, 1984) in the theater, I have vivid memories of this song being smoothly embroidered into the aural landscape of Venice Beach in the summertime. That was a great place to be a kid: it was no big deal to see large groups of teenage boys skateboarding like maniacs or spinning, twisting and contorting their bodies into quick dance moves on beat-up lengths of cardboard, metal boxes exploding with sound right next to them. Back then I knew nothing of the film. But boy, howdy when I DID finally discover RoboCop (Paul Verhoeven, 1987)? That song (and all its attached memories) meant so much more! One might think that since this was a hard R, almost X-rated film, it would have been off-limits for children’s marketing and merchandising. One would have been wrong. So very wrong. This was the ’80s, remember? So this treasured film that platforms a satiric commercial for the Butler Brothers nuclear war board game NUKEM? It became SEVERAL DIFFERENT KINDS OF GAMES. Let’s check them out! 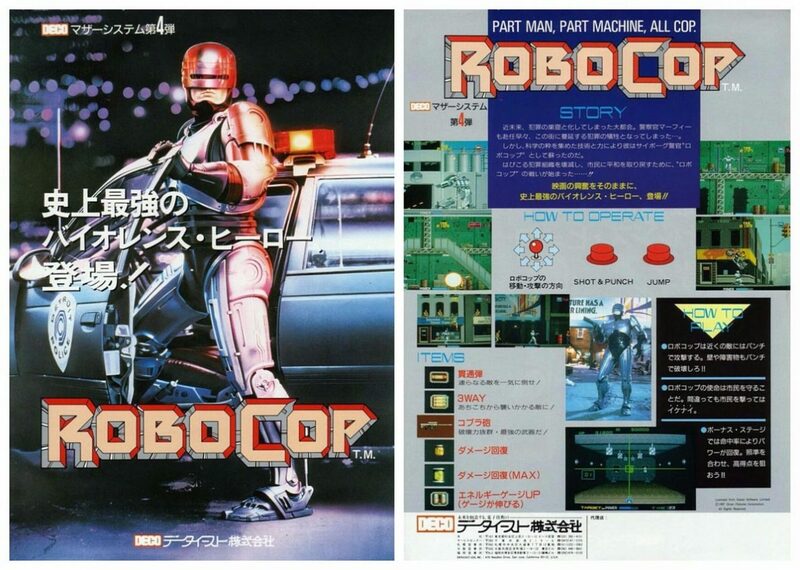 Then there’s the super amazing RoboCop VCR game. Remember VCR games? Yeah, well, some worked and some didn’t. 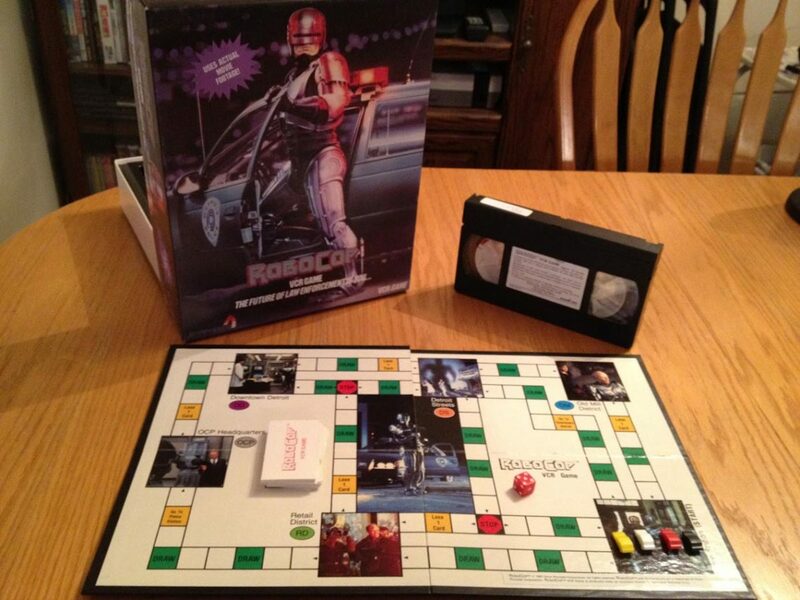 This was part board game, part VHS play-along and used real clips from the film. It didn’t get very good reviews but I still think it looks pretty fun. And the slogan, “The Future of Law Enforcement Is You…” makes me giggle since these folks clearly have no idea what they are dealing with. Have they seen the film? Do they know what or why they are making this game? 10/10, would still play. As for myself, I’m a pinball girl, so I will be on the lookout for this machine. Who knows? It may be like the Sleeze Boyz song. I may have played it already sometime in my younger years and not known it. But now that I am awake, aware and RoboCop-ing sensibly, it is certainly a goal. Also by Data East, this machine advertises “pinball excitement!” and “the world’s first solid-state flipper!” Totally in. I have a thing for solid-state flippers…don’t tell! Moving past the games portion of the RoboCop endowment, we have one of the stranger episodes in 1980s marketing: creating toys from ultra-violent films and marketing them to children. No, this is not me being judgmental. This is simply a part of our commercial history that can be filed under the “Things That Make You Go Hmmm” section. Of course, this is extra fascinating in this case because the content of RoboCop is MOST critical of these kinds of consumer choices. Having noted Verhoeven’s love of satire and its pointed use in RoboCop’s fake ads, looking at these very real commercials is slightly chilling. RoboCop was not only scarily accurate for its time but the way in which it got consumed and marketed to children illustrated how blind the people who distributed it were to its message. Verhoeven laughed all the way to the bank (the film was extremely popular at the box office) and Orion made a healthy profit off all these assorted merchandising efforts but did anyone at Orion look in the mirror and think about Omni Consumer Products or who that was really supposed to be? Not likely. 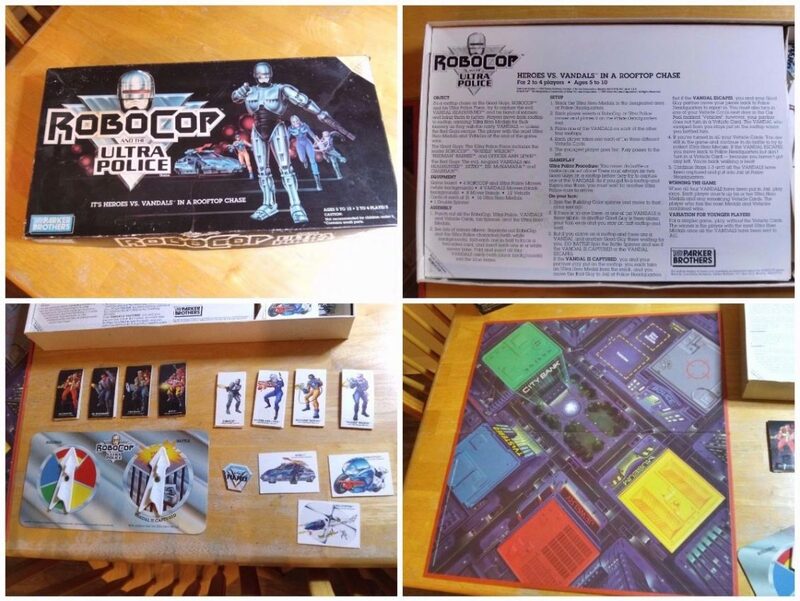 So, this set of toys – RoboCop and the Ultrapolice – with REAL CAP ACTION – were for ages 4 and above. So make sure that Johnny has some familiarity with ED-209 before he hits Kindergarten, ok? This toy, the RoboCopter, has fuckall to do with the film, and yet… clips from the film make their way into the ad. RoboCop is not a movie for kids. It’s probably ok for young adults, but definitely not children. 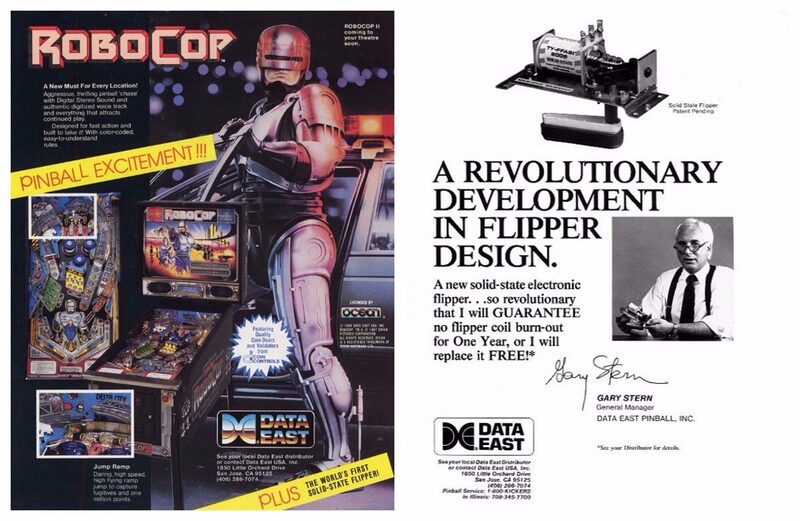 The way this ad is constructed makes it seem like not only are the toys fine for kids to access, but RoboCop is fine as a media playmate as well. Okay, so the truth is that most of us born in the ’70s or before saw lots of violent films early on. And really? Most of us are just fine. This isn’t about gauging or deciding when a kid should engage with a media text as much as it is about how dreadfully tone-deaf this ad (and all the other children’s toy ads) are when it comes to what the film is about. Turning RoboCop into a kids’ toy ignores the complexity of the violence in RoboCop, and rejects the valuable commentary evoked from even the most graphic of scenes. So I’m not going to end with a downer. 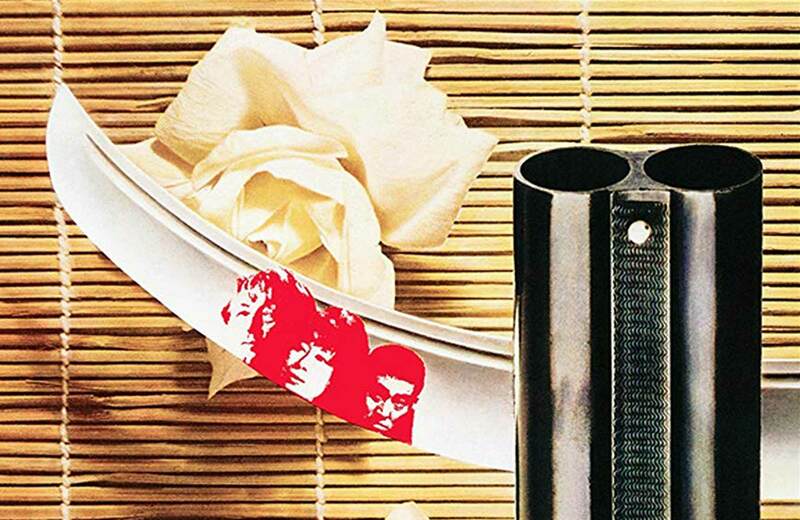 In reality, while there is a certain problematic aspect to the fact that R-rated toys were marketed to babies and a film that deeply critiques consumer culture was turned into one of the most highly merchandised action films of the 80s, there is absolutely something wonderful about being able to enjoy this paraphernalia. There is a reason that many people, as adults, continue to buy toys (even RoboCop toys!). It is fair to look at these things and grimace at the companies that produced them and go: did they even see the film? And if so…. um, ew! It is just as valid to have a wonderful and joyful reaction to the action figures and start making Google alerts to try to find them for your own collection. RoboCop was part of the squared circle!! CHECK IT OUT! !